Praise be to the turbo gods. Now if we can only get Subaru to move away from the scourge of CVT transmissions. The new-to-the-Outback 2.4-liter turbo boxer gets 277 lb-ft of torque with those 260 horses with a towing capacity of 3,500 pounds, getting 23 MPG city and 30 MPG highway. The 2.5-liter naturally aspirated engine is also still around with 182 hp and 176 lb-ft of torque, getting 26 MPG city and 33 highway, Subaru claims. The 2020 Outback is now plopped on the Subaru Global Platform, offering improved stability and stiffness and improved crash protection. It also gets the EyeSight Driver Assist tech, adaptive cruise control, a driver distraction mitigation system to keep you wired to the road. The new crossover will be available in Base, Premium, Limited, Touring, Onyx Edition XT, Limited XT and Touring XT trims, with the new Onyx Edition getting black-finish exterior features, 18-inch alloys, and a water-repellant, two-tone grey interior. It’s only available with the 2.4-liter turbo, as are all XT trims. 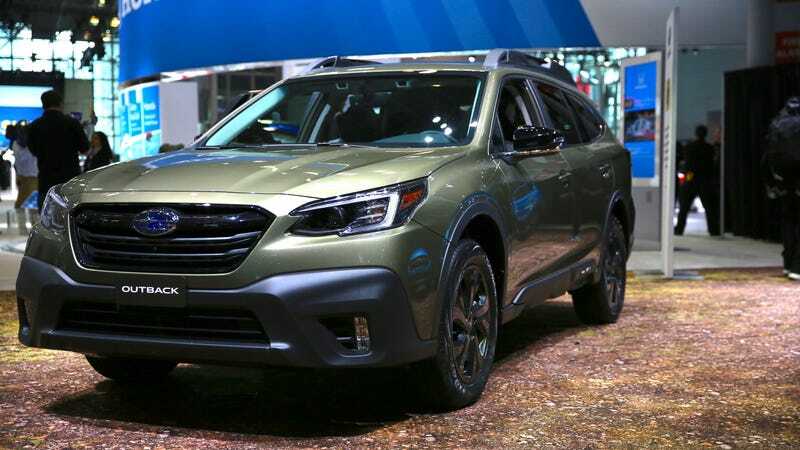 Every new Outback has 8.7-inches of ground clearance, standard Subaru Symmetrical All-Wheel Drive with torque vectoring, and an X-MODE that includes hill descent control. Then there’s the 11.6-inch tablet screen, standard on all but the base models, just like the new Legacy also has. It’s definitely taking a page out of the Tesla and Volvo playbook here.